Man dead after salt bin collapses, efforts to retrieve body continued overnight. Lansing, NY (www.NewYorkInjuryNews.com) – A salt bin collapse at the Cargill Salt Mine in Lansing, NY on Wednesday, March 24, 2010, left one worker injured and another dead, according to WSYR-TV. Reports from Tompkins County Sheriff’s Office state the collapse of the salt bin occurred at approximately 6:30 p.m. Wednesday, March 24, 2010. Apparently, a salt bin collapsed onto two men as they were loading salt into the truck. Recovery efforts were ongoing at approximately 9:30 a.m. Thursday, March 25, 2010. Mark Klein, Manager of Communications for the Cargill Salt Mine informed reporters, “We’re very concerned and we’re working with authorities to investigate how this happened.” He further told reporters that they ceased any production after the incident and sent people home. It is unclear when the mine will reopen. 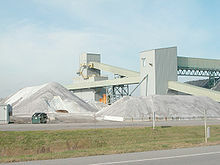 The mine produces salt for roads, and is located on Cayuga Lake in the Finger Lakes area, near Ithaca, NY. Neither man in the accident has been identified. WHEC reported that grief counselors were on site Thursday, March 25, 2010, for workers affected by the accident. Legal News Reporter: Tara Monks – Legal news for New York workplace injury attorneys.